As a mother of three, I know how hard it can be to find the right baby stroller, that’s why I created this website – to help you in this incredibly difficult task. Below you can find my personal ranking of TOP Baby Strollers available on the market in 2019. This ranking is based on my 5-year experience as a mom and hundreds reviews written by other parents. 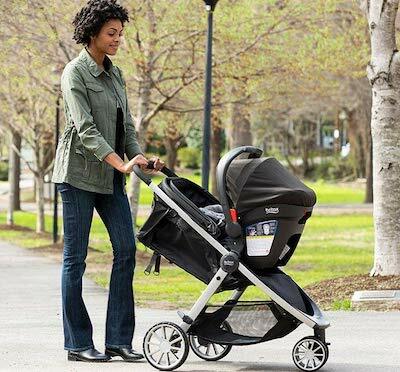 This list includes new stroller that come out in 2019, as well as best-selling strollers which have been on the market for several years. With my ranking you will find the perfect stroller for your baby! If you already know what type of a stroller you want, use the quick menu below to skip to my reviews. What type of a stroller do you need? 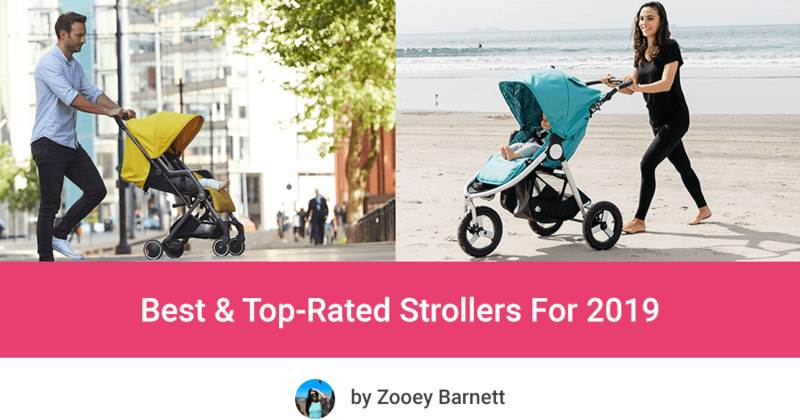 Here is my list of the best strollers 2019. I picked for my ranking strollers that come out in 2019 while others were released in previous years and still are unmatched! Britax B-Free doesn’t stop surprising me. This stroller has probably the largest sunshade and the biggest amount of storage pockets on the market! It’ll still be a HIT in 2019! It has 3-wheel design with single front wheel – it is first Britax stroller with such a construction. Thanks to it the stroller is really nimble. The wheels are all-terrain and have rubberized tires, so you can stroll over pretty much any type of terrain and don’t have to worry about inflating. The seat is very roomy and pretty long and has the capacity of 65 lbs which make Britax B-Free a stroller for big kid! The seat goes almost all the way down and you can stop at any height you want, thanks to infinite recline. You will easily find the most comfortable position for your baby. Moreover the seat fabric is textured and breathable to provide baby with ultimate comfort during strolling. Here’s the best thing about Britax B-Free: it has plenty of storage space! Under the seat there is a HUGE basket that can accommodate large diaper bag and few other things. This stroller is also equipped with SEVEN additional pockets, hidden all over it – it’s really amazing! 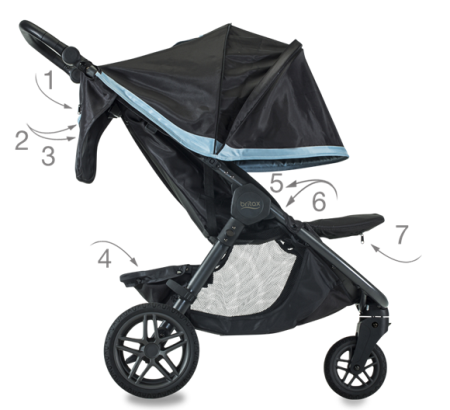 Another advantage is that it has probably the biggest canopy among all everyday strollers! To expand it we just need to use the hidden zipper. It protects baby from head to toe. I’m sure B-Free is going to be TOP stroller of 2019, because it is so well-equipped. Top-notch product! We can use Britax B-Free from birth thanks to compatibility with Britax infant car seats. You buy B-Free Stroller with infant car seats adapters included and add the car seat later or you can purchase B-Free Travel System (here you can check Britax B-Free & B-Safe 35 Travel System). 1. Thanks to long seat back and high weight limit you will have the ability to use this stroller for a longer period, for a bigger toddler or older kid. You won’t need to spend money on another stroller when your child gets older and heavier. 2. This stroller has infant car seat adapters included so you don’t have to pay extra for them and you can add an infant car seat whenever you need it! 3. With such a large storage space you could take everything for day trip or overnight visit to grandparents. You won’t have to choose between your child’s favorite toys and diaper bag anymore. Psst! 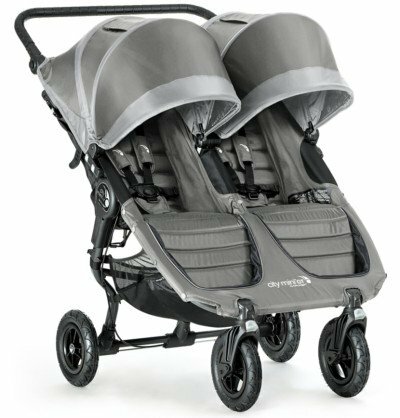 Britax B-Free comes in three color versions: Midnight, Front and Pewter. Click here to check the availability and compare prices for all colors. 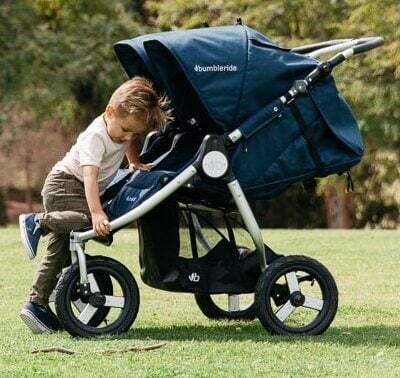 My ranking of the best baby strollers for 2019 wouldn’t be complete if I didn’t include Bumbleride Indie. This fantastic convertible stroller has so much to offer: seat suitable from birth, all-terrain wheels, large canopy, adjustable handle and much more. It’s compatible with many different infant car seats, as well as Bumbleride bassinet. All these feature ensure convenience of using for parents and comfort of riding for baby. You will love the generous padding on the seat which feels very soft and cushy. It comes in 6 different colors which make Indie truly beautiful stroller. 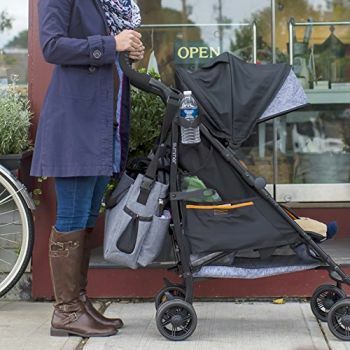 Bumbleride Indie has all features that allow you to use it as an everyday stroller. But thanks to good suspension and big wheels with pumped tires, you can also take it for an off-road stroll. According to parents who own it, it can even handle sand and snow! 3-wheel design and air-filled tires ensure smooth steering and great maneuverability. This stroller is nimble and easy to operate with one hand. It glides like a breeze and doesn’t get stuck on cracks in sidewalks or grass. The pavement is old and bumpy in your neighborhood? Or maybe you like to go for walks on unbeaten paths? This all-terrain convertible stroller won’t disappoint you. 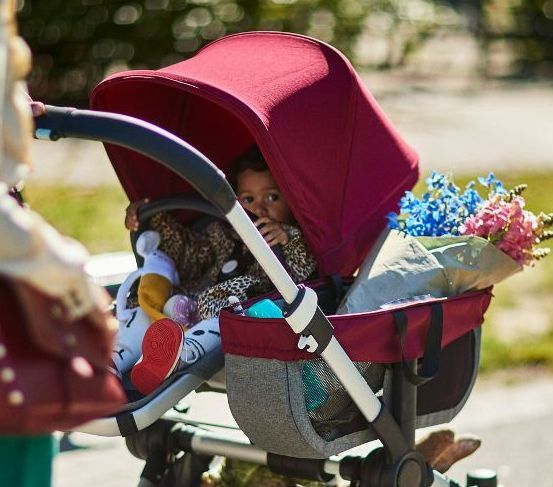 Apart from the large wheels, there is one more feature that makes Indie one of the best strollers in 2019: seat that converts into infant-mode ready to use for a newborn baby. All thanks to flat recline and adjustable leg rest that allow you to create an enclosed space for small baby. This way you can start using your Bumbleride Indie from day one. I recommend infant-mode for short walks, mostly because the seat is not reversible therefore your newborn baby won’t be facing you. Looking through peek-a-boo window will be the only way to check on the baby. If you plan on frequent strolls with your newborn the bassinet will be a better choice (you can purchase it here). Another great thing about this convertible stroller is it’s compatibility with different car seat brands: Maxi Cosi, Cybex, Nuna, Graco, Chicco and Peg Perego. You can attach the infant car seat onto the stroller with or without the main seat attached, whatever you prefer. At the end, I would like to emphasize that Indie is not a tiny, compact stroller. It weighs 24 lbs and its construction is fairly big. But it has to be strong enough to hold a bassinet or car seat with a newborn! Besides, all-terrain wheels and suspension system also add some weight. But frankly, it’s not excessively heavy or cumbersome! I think 24 pounds is not a big price for having such a multi-functional, reliable stroller. I checked customers reviews at Amazon and Bumbleride website and here’s what I found. Parents love the possibility of converting the seat into infant-ready mode. 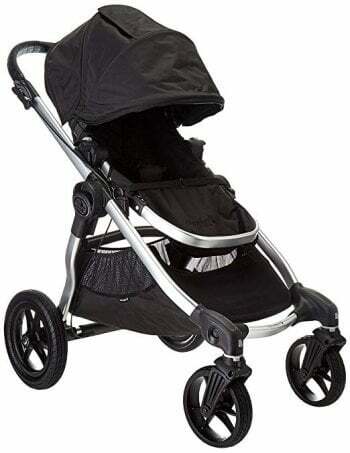 There is also large canopy and vented seat top that make this stroller great for summer. Indie provides smooth rides and pushes with one hand. The biggest advantage is its versatility – it’s relatively compact for daily use and strong enough for off-road trips and occasional jogging. Although Indie can be even used for light jogging, I don’t recommend it for advanced runners who love higher pace and long distances. If you’re looking for a stroller that you could use mainly for jogging and only occasionally for strolls, choose Bumbleride Speed. 1. It can be your only stroller – from birth to toddlerhood, for all kinds of terrain, mainly for strolls and occasional jogging. 2. This newest model of Indie has improved canopy that give the baby more room to grow. It also provides excellent protection from sun rays. 3. You have a few options for newborn baby: main seat converts into infant mode, you can also attach separately purchased bassinet or infant car seat. All depends on your preferences and budget. City Tour LUX was released last year and has been a best seller among traveling parents. This awesome stroller is suitable from birth, in contrast to its older brother City Tour! I’m sure you are thrilled to hear about Baby Jogger City Tour LUX useful features. What are the main features of Baby Jogger City Tour LUX? It has reversible seat and reclines to near-flat position to accommodate infants (from 3 months). The oversized canopy provides full coverage and protects baby from sun rays. 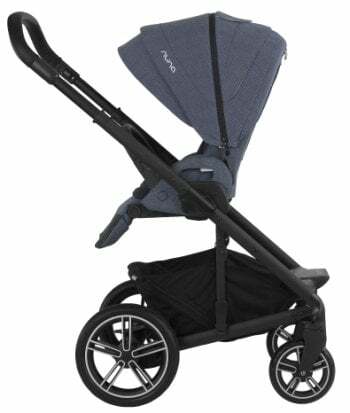 The new Baby Jogger City Tour LUX is the compatibility with infant car seat! This is the feature that many parents (including me) were waiting for! Now we can remove the main seat and install infant car seat with a proper adapter. It can be also used with carrycot – sold separately (check it here). 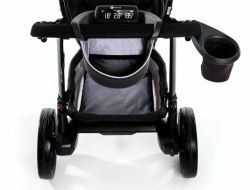 The stroller will include also few accessories that were sold separately in the previous version. The stroller with comes with belly bar and cup holder included. What more can we expect from upgraded City Tour LUX? Capacious basket underneath the seat with more easy access, adjustable leg rest, shock absorbing wheels, smooth maneuverability and awesome compact fold, to name few. This stroller is a breeze to push and folds quickly thanks to patented technology! City Tour LUX from Baby Jogger is a great light stroller for everyday use and travel therefore I could not miss it on my list of the best strollers 2019! It offers very compact fold, but it’s bigger than the original City Tour has. Although this stroller probably won’t fit in overhead compartment on airplane, it is still useful for travel by train or car. 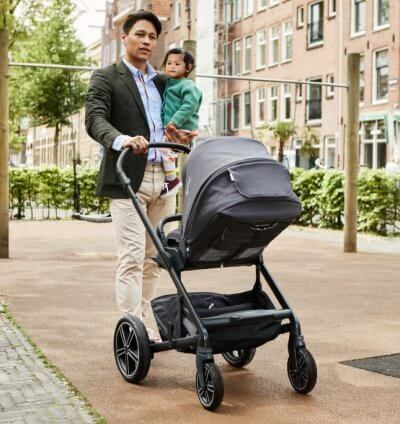 Baby Jogger City Tour LUX is heavier than previous model, but now it has awesome features that make it a versatile everyday stroller, suitable for newborns, which is still very compact and portable. 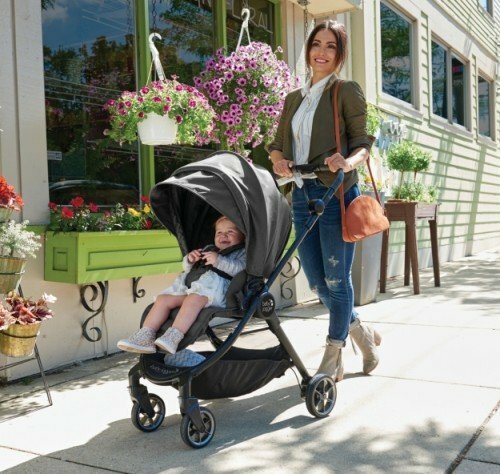 I have a feeling this will be one of the best convertible strollers for 2019! The wheels are rather small so they are not suitable for an off-road cruising. Moreover, since it weighs 19 lbs it is rather a standard convertible stroller, however very light and portable. 1. Finally there is a light stroller for everyday use from birth! Thanks to City Tour LUX travels with your infants will be so much easier and delightful! 2. This stroller was design for busy, active parents who are often on the go. Thanks to different seating options, plenty useful features and light design you will have everything your may need! 3. For an affordable price you can have a stroller that does everything. It can serve you since day one, it can be your everyday stroller or travel stroller. 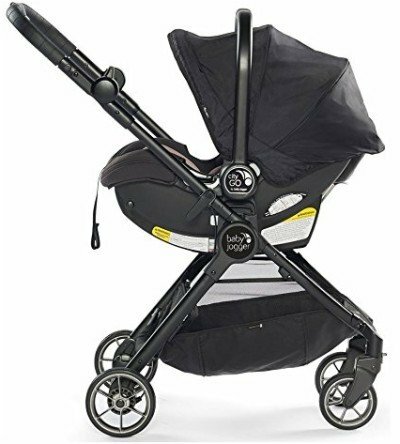 Baby Jogger City Tour LUX is at Amazon in a few color versions. You can check its price by clicking here. You can also check the current price for City Tour 2017. If you still need more information read my full reviews of Baby Jogger City Tour 2017 or Baby Jogger City Tour LUX. UPPAbaby didn’t forget about their second iconic stroller, which was also upgraded last year. For 2019 it stayed exactly the same – amazing! This stroller is narrower and lighter and has smaller wheels than VISTA. Generally speaking, CRUZ is more compact. What were the changes for UPPAbaby CRUZ last year? All color versions include 100% premium leather parts that don’t contain any chemicals. Similar to VISTA since 2018 CRUZ has powder-coated frame (instead of carbon-coated) to minimize the risk of scratching. 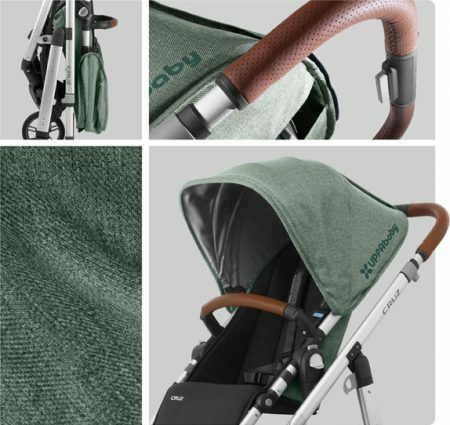 There are also two new color versions for UPPAbaby CRUZ since 2018: Jordan (Charcoal Melange) and Emmett (Green Melange). Ok, so you may ask, what makes UPPAbaby CRUZ so special? Well, I’m aware that not every parent need expandable stroller like VISTA. CRUZ offers the same high-quality and functionality, but in a smaller and lighter size. It has the same toddler seat which is very comfortable and roomy. Child can ride facing parents or the World. It also has the amazing, polyurethane wheels which provide smooth and easy pushing, adjustable handlebar, large basket underneath the seat and four-wheel suspension.The canopy is made of a high-quality material and it locks when we pull it down or up and stays in place. UPPAbaby CRUZ can be also turned into a travel system. It works with many popular infant car seats with special adapter. We can also install onto it the MESA infant car seat and use it without any adapters. Just like VISTA, CRUZ is suitable from birth up to 50 lbs. However CRUZ doesn’t come with a bassinet. Therefore if we want to use this stroller since birth we have to purchase the bassinet separately. If you need a stroller for only one child at a time, UPPAbaby CRUZ might be just for you. This is a full-size stroller, yet it is quite lightweight and compact. For me and many other satisfied parents, CRUZ is great convertible buggy and one of the best strollers of 2019. You can also read my full review of UPPAbaby CRUZ which includes detailed comparison of CRUZ models from 2017 to 2019. This stroller is convertible, but not expandable, which means that you can use it with different seats, but only for one child. The wheels, which are small and polyurethane, can’t handle too much of a terrain – on bumps they roll less smoothly than big air-filled wheels. 1. It has many versatile features, that luxurious strollers have. These functions provide comfort of using and overall fantastic performance. 2. Great quality for an affordable price! It’s perfect for parents who want high-end product, but have smaller budget. 3. This is full-featured stroller but it is pretty light, compact and portable – awesome choice for city dwellers who are often on the go with their baby. CRUZ is cheaper than VISTA. If you want to check current price of latest model of UPPAbaby CRUZ and see available colors – just click here. I picked this model for my list of the best baby strollers 2019 not only because it’s a great convertible stroller, but also because it really follows fashion and technological development and it’s one of the the most innovative strollers right now. I guess technology is in every part of our lives, but very rarely brands that make strollers use it. 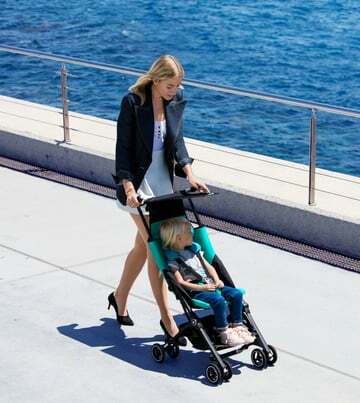 In fact, only 4Moms offers a pushchair that integrates technology with a stroller. It includes an LCD dashboard where we can control our distance, speed, temperature, time and calorie burn the whole time! Oh, and charge our cell phone! Now you are probably curious how does it works? There are built-in power generators in the rear wheels that work from stroller movement. This self-charging battery powers up the LCD screen and gives us the ability to charge our phone. What motivated manufacturers when they were designing Moxi stroller? Well, according to them today it’s not just about bringing child from one place to another, but connecting strolling with technology, that we are used to every day. 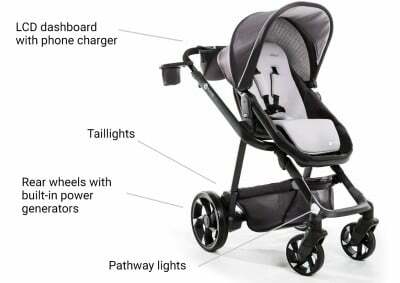 Nevertheless, Moxi has also couple of “regular” features like many other strollers do. It grows with your baby – you can start using it with infant car seat, then switch it for a toddler seat, forward or parent facing, with a weight limit of 55 lbs. The main seat also converts to a bassinet! 1. It will keep you and your baby safe and visible during evening and morning strolls, thanks to headlights and taillights. They will also illuminate your pathway. 2. This stroller is a smart investment and it can be your primary and only stroller, since the main seat converts from a toddler mode to bassinet mode. You spend money once and have stroller for few years. 3. 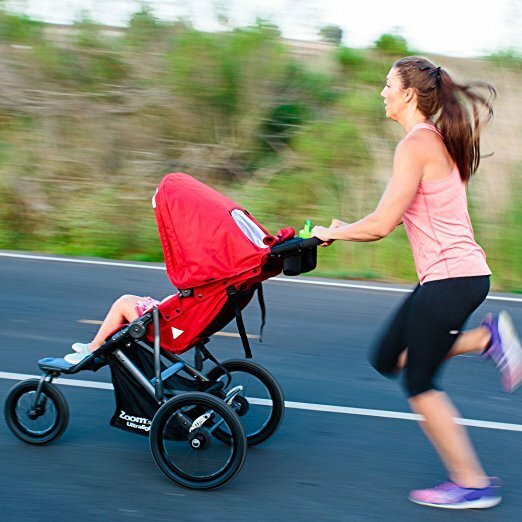 This stroller can be a great help during getting back into shape after pregnancy, since it allows to monitor distance, speed and calorie burn! I am probably one of the biggest fans of UPPAbaby VISTA Stroller. In my opinion UPPAbaby VISTA was a great stroller, but thanks to some upgrades in the last few years, this is now one of the best strollers for 2019! For 2019 UPPAbaby didn’t make any functional changes. The only new thing about VISTA 2019 is the color lineup. The brand has added three new colors. Bigger improvements were made in 2018 – these changes had influence on VISTA’s performance. Of course all of these upgrades have been maintained for 2019. UPPAbaby VISTA 2018/2019 have 100% premium leather parts in all color versions! What I like about it is the lack of chemicals confirmed with certificates. Since last year UPPAbaby VISTA has extended bassinet. The new bassinet has 2.5 inches longer sleeping area. It may seem like a small change, but thanks to it, it is suitable for taller babies. What’s really great is that you don’t have to worry that your VISTA got more bulky. The dimensions of the bassinet didn’t change, UPPAbaby just changed the dimensions of the mattress pad and the fabric. What are other updates made for UPPAbaby VISTA last year? It has new front wheels design – the front tire will match the rear tire. The handlebar is replaceable and the frame is powder-coated in the new VISTA 2018 and VISTA 2019 (instead of carbon-coated) to minimize scratching. UPPAbaby VISTA 2018/2019 grows with your family, providing you with better functionality and more glamorous look. I’m sure this stroller will give you with everything you might need! Apart from these changes, UPPAbaby VISTA remains the same excellent and multitasking stroller like it has been for the last few years. Parents can use UPPAbaby VISTA 2019 and 2018 since day one with a cozy bassinet which is also suitable for overnight sleeping or many infant car seat (for UPPAbaby MESA infant car seat we won’t even need any adapters!). When the baby can sit straight and hold his head up unassisted parents can switch to a toddler seat that reclines fully for a comfortable snooze. The toddler seat can accommodate a child up to 50 lbs. VISTA 2018/2019 still offers great extendable canopy with peek-a-boo windows that close with magnets. The canopy is made of different material which won’t wrinkle and it locks when you pull it down or up to stay in place better. There is suspension for ultra-smooth ride and polyurethane wheels for effortless navigation. It has also option of expanding into a double (with a Rumble Seat) or triple (with a PiggyBack board). There is telescopic extendable handlebar – great for parents of different height. It features one of the biggest baskets on the market – you can put 30 lbs under the seat. – BIG PLUS! VISTA may be pretty heavy for some parents and the expanded version for two or three kids is even more clumsy. It may be hard to lift for parents with back problems or moms after C-section. 1. It really grows with the child and the whole family, so you won’t have to spend extra money for another stroller when your baby gets older or when next baby come into the World. 2. This all-in-one stroller gives parents flexibility. They can use for many different purposes at least for few years. 3. VISTA is user-friendly: it’s easy to push and maneuver, has large and stable canopy and the biggest storage basket on the market – perfect for day trips or shopping lovers. 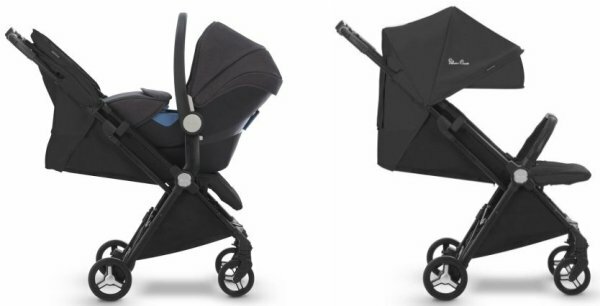 You’re probably wonder about UPPAbaby VISTA 2019 release date & price. The new stroller fashions hit the market in February 2019. You can check their price by clicking here. Other color versions can be found here. I also invite you to read my full review of UPPAbaby VISTA that includes comparison of all recent models: 2019, 2018 and 2017. The Bugaboo’s multi-purpose stroller also has gone beautiful makeover. The newest Bugaboo Donkey2 (from 2018) is even more functional, more convenient to use for parents and more comfy for babies. This is the ultimate convertible stroller that can be customized to suit parents’ style and expanded to adjust to growing family’s needs. You’re probably interested what are the changes for the Bugaboo Donkey2? Manufacturer has changed not only the stroller’s look, but also added features to improve comfort, convenience of using and stroller’s performance. Bugaboo Donkey2 has improved all-wheel suspension and new foam-filled tires. 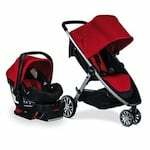 This two features provide more smooth and comfy ride for the babies and easier operating for parents. The new wheels finally have the right pressure and they actually imitate air-filled wheels! The side basket which can be used in Bugaboo Donkey2 Mono version is now bigger, has built-in pockets for items like phone, keys or wallet, and has a cover to protect your essentials, yet keep them at hand. The new side luggage basket can hold up to 22 lbs of your stuff. New Bugaboo Donkey2 has also updated foot brake which can be easily used in flip flops, high heels or sneakers. Bugaboo Donkey2 offers really nice customization. We can choose the color of the chassis: silver aluminum or black. All color version include vegan leather handlebar and carry handle. Base fabrics of Bugaboo Donkey2 are available in three colors. Sun canopy and side luggage basket are available in eleven (!) color versions. There is a new part of the stroller called Base Fabric which includes Bugaboo Donkey2 seat fabric with 5-point safety harness, bassinet fabric with comfy mattress, apron and side basket. The bassinet apron also has upgraded design for better fit. The chassis also has been upgraded to ensure long-term use. As you can see you can customize your Donkey2 and choose different parts and color versions so it will suit you style perfectly. Wide variety of colors and parts might be confusing at first, so let me know in the comment section below if you need any help and I will do my best to help you choose the most gorgeous version! 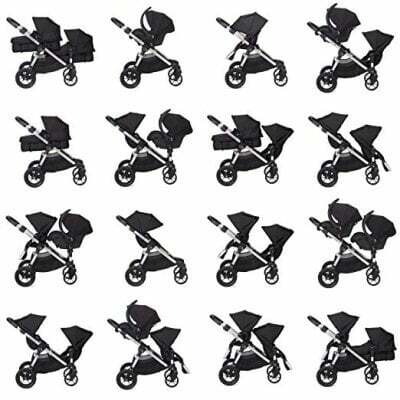 Bugaboo Donkey2 is still available in three configurations: Mono, Duo and Twin. Mono is perfect for parents who have one child now and can be used since birth. Duo is for parents who have two children of different ages. Twin is designed for parents of twins. Duo and Twin version also can be used since birth, with a bassinet or infant car seat (sold separately). This convertible stroller is very easy to navigate even when it’s fully loaded. It maneuvers very smoothly and has tight turning radius. And it comes with a rain cover! With all of the updates and upgrades Bugaboo Donkey2 is going to serve you forever! 🙂 Such a convertible and multitasking buggy may be the best stroller for 2019. In Mono version this stroller is wider than standard single strollers. With two seats it is pretty big and heavy. For easier storage or transportation you will probably need to take off the seats and wheels. 1. This stroller is an excellent investment for parents who plan on having multiple children or want to have a convertible all-in-one stroller for one child. 2. Thanks to high-quality materials and upgraded stable chassis it will serve you for years. And other moms will be so jealous of its chic look! 3. It was designed with baby’s and parent’s comfort in mind. There is adjustable handlebar for parents of different heights and foam wheels that ensure comfortable pushing and bumpless ride. Bugaboo Donkey2 is available for example at PishPosh Baby. The price depends on the version you choose: color and seating configuration (Mono, Duo, Twin). 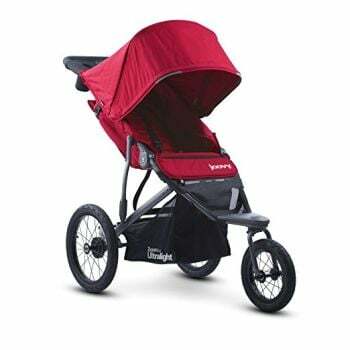 This stroller is super pricey, so before you decide to buy your Bugaboo Donkey2 make sure to check available discounts! 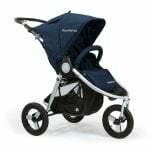 Baby Jogger City Select has been beloved by many moms and dads for the last couple of years. It’s a best-seller! And in my opinion it is still one of the best strollers in 2019. This stroller can be used as a single or double one. If you install specially designed standing board even three kids can ride in it at the same time! What I love most about this stroller? Its multi-functionality and flexibility in terms of seating configurations, as well as the types of terrain it can handle. City Select has 16+ different seating options! You can use it with one toddler seat or switch it for an infant car seat or bassinet. You can also add the second seat, as well as the Glider Board and Bench Seat for the oldest sibling! Psst! There is also new version – City Select LUX that has 25% more seating options than the original City Select Convertible Stroller. You can read my full review of Baby Jogger City Select LUX or check its price (it’s more expensive model). Moreover, the seats are reversible, so the child can ride facing forward or facing parents. And if you use the stroller for two kids, they can fit facing each other. It’s so much fun! City Select LUX is not an ultra-compact stroller, but it should fit in most car trunks. 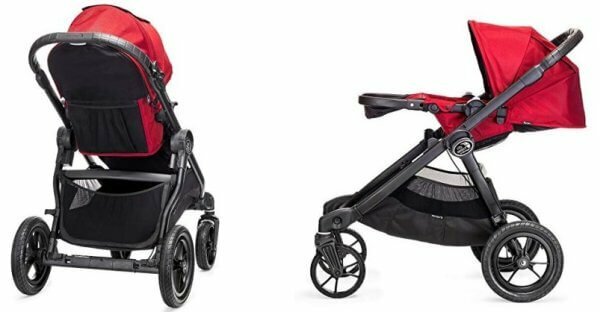 Other great features of Baby Jogger City Select Stroller: extended canopy with UV50+ protection and peek-a-boo window with silent magnetic closure, multi-position recline, adjustable leg support and a hand brake. There is also suspension system therefore the stroller rolls smoothly and riding in it is really comfy and bumpless. It’s probably not suitable for sandy beaches or mountain trails, but it will do fine on grass or dirt road. This is definitely an example of the best stroller of 2019. What’s also great is the color lineup – there are over 10 colors to choose from so you’ll be able to find something that suits your style. I always check other customers reviews of product that I’m about to buy, especially when it is for my children. I’ve read parents reviews at Amazon and here are the main assets and flaws they mention. Parents praise City Select for smooth maneuverability and vast choice of sitting options. The fold is fairly compact therefore it’s easy to stow away. Parents also love large sun hood that keeps the sun out of baby’s eyes. Big advantage of this convertible expandable stroller are the wheels that can handle cracked pavement, gravel, dirt and grassy roads. Another useful function is the handbrake. Some parents complain about the size of the seats, which are suitable only up to 3 or 3.5 years. With two seats attached this stroller is quite heavy and large. It’s design rather for average and tall people (above 5’3″). Oh, and one more thing. Don’t get fooled by the brand’s name – this stroller is not suitable for jogging, it is an everyday convertible pushchair. 1. This stroller adapts to growing family needs and can be the only stroller you will ever need. You can save money, because you won’t need another stroller when the second baby arrives. 2. Thanks to big wheels and suspension your baby will always ride comfortably and you won’t have any problems with pushing and steering. 3. You will love the flexibility of using different seats and combinations, according to your needs. I know City Select is a pricey stroller so I frequently check if there are any promotions. Often there are big discounts at least for some of the color versions. You can compare all prices at Amazon or at PishPosh Baby. I must admit, I like Evenflo brand, as it offers really good-quality products at affordable price. And when the Xpand Modular Stroller came out it won my heart immediately and this is still one of the best strollers for 2019! Evenflo Xpand Modular is a single to double stroller. It offers more than dozen different seating configurations for one or two children, therefore you can be sure this stroller will adapt to your growing family. Xpand Modular can be your only stroller till both of your kiddos reach the limit of 110 lbs (55 lbs per seat)! This stroller is made for parents who want a flexible and expandable stroller. 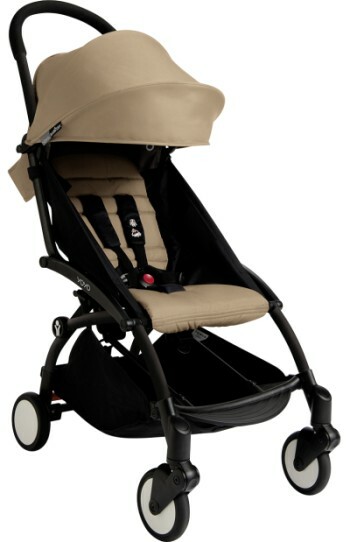 The main seat is suitable from 6 months and features multi-position recline. It has also adjustable leg rest. This seat has two more fantastic features: it’s reversible and converts into an infant mode suitable from 3 months. There is also 3-panel canopy with mesh viewing window that provides extra air-flow to the seat. The canopy is not large, but it’s sufficient so I’m not going to complain about it. It’s worth to mention that you can purchase the Xpand stroller separately or as a travel system with SafeMax Infant Car Seat (it’s the only way to make this expandable stroller suitable from birth). Of course you can add the infant car seat later as it is also available for separate purchase. Thanks to that you can use Xpand as a stroller for infant and toddler. I have to tell you about one more amazing feature that Xpand has. It comes with built-in lower and upper adapters, so when you want to expand it to a double stroller you don’t have to purchase any additional adapters or worry about losing them somewhere! Many expensive strollers require additional adapters when you want to expand them, therefore you need to spend extra money on them. Big plus for Evenflo Xpand for having all adapters included and built-in. 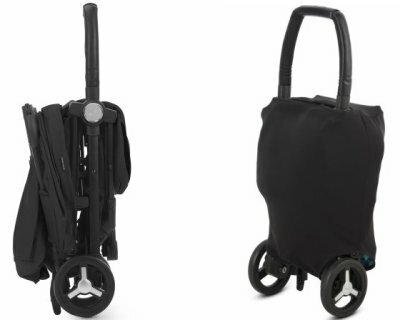 Thanks to this feature it really stands out from other best expandable strollers in 2019. You can read more about seating configuration and Evenflo Xpand Modular features in my full review. Folding is quick and easy, though it requires using two hands. The stroller folds up with one seat attached, sibling seat has to be removed. Folded Xpand with one toddler seat takes up similar amount of space as UPPAbaby VISTA – it’s not ultra-compact, but it’s not bulky either. What’s important to keep in mind is that Xpand is designed strictly for city use. It has rubberized plastic wheels and rear-wheels suspension which provide smooth ride, but rather on flat surfaces like pavement or hard-packed gravel. On more rough terrain the stroller will probably wobble. The wheels are not as multi-functional as wheels on City Select or VISTA, but this is one of the reasons why Xpand is about 3 times cheaper than VISTA! Evenflo Xpand Modular can be used for one or two kids – each seat has capacity of 55 lbs! I’m aware that Evenflo Xpand Modular is not perfect – it has some negative reviews and may seem to be less functional than other, high-end, expandable strollers. However, I decided to include it in my ranking as one of the best expandable strollers for 2019, because it can be wonderful option for parents who need a good single-to-double stroller for two children, but have limited budget. This stroller may be a serious competition for other expandable strollers because it has much more pocket-friendly price! 1. It is much cheaper than other expandable strollers. So if you have or plan on having more children, but don’t want to spend a fortune on a double or expandable stroller, this may be great choice. 2. With its huge storage basket you will always have enough space for all baby gear and shopping bags. 3. Main seat and sibling seat have the same size and capacity – in contrast to some pricey expandable strollers. This makes it a good option for twin toddlers. Since I’ve discovered Nuna MIXX2, I am fascinated by this brand. 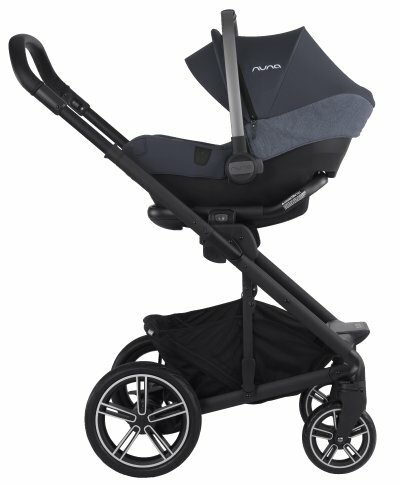 And now I’m really excited that they updated their famous stroller for 2019 and return to the original name – Nuna MIXX. What’s also important now it’s only available as a travel system with Pipa Lite LX car seat. Let me tell you a bit more about MIXX first. Here’s everything you need to know about this convertible stroller. Nuna MIXX 2019 comes with a redesigned, all-season seat. There is a mesh backrest that easily unsnaps and allows the air to circulate through. It’s a perfect way to protect baby from overheating during hot summer days. On chilly days you can keep the fabric cover on. This seat has also removable bamboo insert that provides additional support for baby’s body and head. It’s a really nice addition, especially since this seat is meant to be used for newborn baby. Almost flat recline plus adjustable leg rest plus the infant insert allow to create cozy and sheltered environment for a small baby. It’s a good solution if you have to stick to your budget and can’t purchase bassinet (or for example don’t have room at home for it). Nuna MIXX 2019 seat is reversible and equipped with a large breathable canopy – another feature that makes this convertible stroller great choice for summer. Another noteworthy feature of this seat is that it’s mounted high up on the frame so you can use this stroller instead of a high chair for example in restaurants. It also makes taking baby in and out of it much easier because you don’t have to bend low. This is another upgrade that Nuna prepared for their stroller for 2019. Keep in mind that Nuna MIXX is not an expandable stroller, it’s designed only for one child. If you’re looking for a convertible & expandable stroller you may want to check Nuna Demi Grow. Some parents who own Nuna MIXX 2019 say that it’s a big heavy. Moreover, for that price it’s a bummer that it doesn’t include accessories like cup holder or child tray. At the end, I have to mention that right now Nuna MIXX 2019 is available only as a travel system that includes Pupa Lite LX car seat. It’s one of the lightest, safest and most innovative infant car seats on the market right now. Ring adapter that allow you to connect the infant car seat to the stroller frame is included in price. It’s one of the most expensive convertible strollers – make sure it really meets your needs before you decide to purchase it. You can find more details about it here. 1. This multi-tasking stroller handles many types of terrain, so it is great for city dwellers and off-road strolls fans. 2. It provides ultimate comfort for the little rider thanks to cushy and breathable seat. 3. Nuna MIXX 2019 is one of the best travel system strollers for 2019. It looks cute and its quality is top-notch and guarantees many years of use. If you need more info about this stroller check my full review of Nuna MIXX. B-Agile from Britax was one of the most popular strollers on the market for a long time. Now its successor – Britax B-Lively is becoming parents’ favorite. Folding is super-quick and one-handed. B-Lively offers pretty compact and light fold (only 20 lbs! ), as for a full-size stroller. It fits easily in most car trunks and takes a little space in home or garage. This stroller has three-wheel construction, with swivel dual front wheel. Thanks to it navigation and turning in tight corners is a piece of cake! 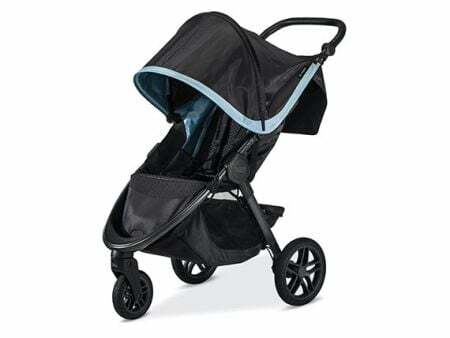 This stroller features also upgraded, large canopy that offers full coverage and enlarged mesh peek-a-boo windows. There is also reclining seat with almost flat position, all-wheel suspension for comfy ride and a foot brake that is easy to operate while wearing sandals. Britax B-Lively Stroller includes a bigger storage underneath the seat where we can fit plenty of baby gear. B-Lively has one more great function. Switching between toddler seat and Britax infant car seats is quick and simple, thanks to Click&Go System! B-Lively can be turned into a travel system with many other car seat brands too, we just need a different adapter for it. Therefore B-Lively can be used since day one till toddlerhood (maximum capacity is 55 lbs). Overall, Britax B-Lively is definitely one of the best baby strollers of 2019. It is a standard multi-tasking stroller, yet very lightweight and convenient. I have a feeling B-Lively will be Britax’s another best selling stroller. I always check other parents reviews before I buy something for my babies! In this case other customers praise this stroller for great quality, easy steering, turning and folding. According to many parents it feels sturdy and lightweight. Among small drawbacks that they mention is non-adjustable handle. One more thing, B-Lively comes in different configurations. You can purchase the stroller separately, or as a set with B-Safe 35 or B-Safe Ultra car seat. There is no cup holder or parent and child trays, so if you would like to have them, you will need to purchase them separately. Plastic wheels handle many types of terrain, but on bumpy terrain they perform less smoothly than air-filled tires. 1. This is one of the currently popular strollers and car seats in the US. Why? It’s hard to beat the combination of useful features, lightweight construction, quick and compact fold and on top of that – pocket-friendly price! 2. Forget about clumsy, unwieldy and sluggish strollers! B-Lively pushes and operates like a breeze! 3. This travel system can serve you for many years and it can be actually the only stroller you will ever need! You buy once and don’t have to spend money anymore! 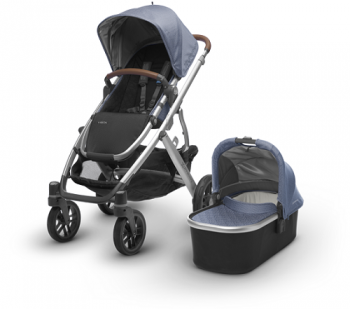 Would you like to compare this new Britax B-Lively with previous model – Britax B-Agile Travel System? Check my full review. Although this travel system has been on the market for a while, I decided to include it to my list of the best strollers 2019. Why? Well, it’s high-quality, multi-functional, convenient to use and… cheap! 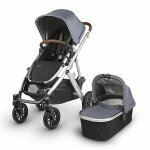 Evenflo Pivot Modular Travel System can be used with infant car seat (included!) and toddler seat, which also offers carriage mode! Main seat is reclinable and reversible. Switching between the seating options is quick and simple. This stroller has also large canopy with mesh peek-a-boo window and OVERSIZED basket under the seat – it’s perfect if you want to go shopping with your baby or pack tons of stuff for day trip. Folding takes few seconds and the stroller is really compact when folded so it takes little space in a car trunk. It weighs only 20 lbs which makes it easy to lift and take in and out of the car. You can also check out my full review of Evenflo Pivot Modular Travel System. This is a best-selling stroller – every time I check it at Amazon it has more and more customer reviews (make sure to check the current number on your own) and most of them are positive! It’s really impressive. Parents praise it for lightweight design, safety features of the car seat and comfortable seat that converts to a fully flat carriage mode. Some parents complain about the wheels quality. Some of the previous owners mention that sometimes the front wheels lock and require using force to make them rolling again. The stroller is not suitable for bumpy roads, it works best on flat, urban surfaces. 1. This is a cheap stroller with infant car seat, however it has features like high-end products. You get not only an excellent and useful travel system, but also cup holder and child tray! So there’s no need to spend any extra money! Check price of the whole set here. 3. It doesn’t come with additional bassinet, but instead the main seat recline fully flat and turns into a carriage mode! So you save space at home and your baby naps in a comfortable position. Another amazing lightweight stroller, for anyone who’s looking for the best stroller 2019. Weighs less than 14 lbs and still has so many cool features. Near-flat position (145 degrees) is very useful for toddlers because it provides comfortable position for napping. We can also use it for changing diapers. I love the fact that seat fabric is removable and can be cleaned in washing machine. This high-quality lightweight stroller is compatible with carrycot and many infant car seats so it can be used for newborns. Although the backrest is not that long, this stroller has tall canopy that offers lots of headroom. So you can actually use this stroller for taller children! Inside the seat there are two mesh pockets where your little passenger can keep snacks, sippy cup or toys. BABYZEN YOYO+ features four small wheels with suspension. Front wheels are swiveling which makes the stroller easy to maneuver and turn, especially in tight corners. You cannot lock these wheels but they have a fancy feature that makes them adjust to the terrain conditions. Nevertheless, you should be aware that YOYO+ is a city and travel stroller – it works best on smooth surfaces, on cobblestone it wobbles a bit. BABYZEN YOYO+ is compact and takes up little space when folded therefore this stroller is perfect for travel by car or train. It works great for flying too, because it fits in overhead compartment on many airplanes! It is also very light so we can carry it on a shoulder effortlessly – with included shoulder strap and carry case. Wow, that’s quite A LOT of features for less than 14 lbs! And what’s also great about this multi-functional lightweight stroller is its beautiful, sleek design. How could you not fall in love with this stroller?! If you want to use this stroller since birth, you need to purchase newborn carrycot or infant car seat, otherwise this stroller is not suitable for newborn. You can check the newborn cocoon here and the adapters for Cybex car seats here. 1. BABYZEN YOYO+ is perfect for parents who often travel by plane. Many airlines accept it as carry-on! 2. This light and multi-purpose stroller is perfect for urban dwellers. It’s slim enough to fit in tight and crowded places. 3. Thanks to high canopy, this is a stroller for taller child. Check my full review of this amazing stroller here. GB Pockit was probably the most popular lightweight stroller on the market in 2016 and 2017. It was a real hit. 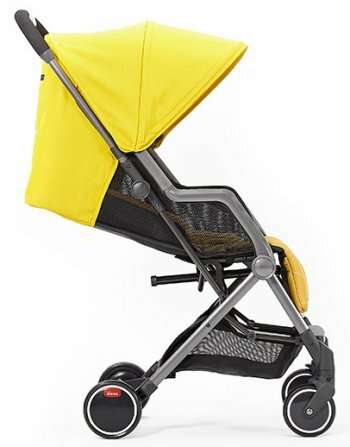 And its new version GB Pockit Plus is also be one of the most popular and best lightweight strollers in 2019. The new version – GB Pockit Plus is still pretty simple and perfect for trips and travels with baby. However, it offers not only smallest fold in the world, but now it has more functions that all parents were waiting for. I must say, GB listens to customers and meets their expectations! GB Pockit Plus offers compatibility with infant car seats and carrycot and the tiniest fold in the world! Now it has reclining seat and it is compatible with infant car seats from GB and Cybex (with adapters) and Cot To Go carrycot, so you can use it since day one till your baby is ready for school! 🙂 Besides, it finally has bigger canopy! GB offers one new accessory. It is a Pockit Travel Bag were we can fit Pockit stroller (both versions) so traveling and storing is even more simple. Of course the new GB Pockit Plus still offers super tiny folding size (although the size and weight has been changed a little bit – read more in my full review) and automatic lock as the original stroller. So now we have the same tiny stroller but upgraded with desirable functions! The new GB Pockit Plus still has really small wheels, not suitable for harsher terrain. 1. The most compact stroller in the World has now a recline seat, so it not only makes travel with baby much easier, but it also provides little passenger with better comfort! 2. Since it is compatible with infant car seat you can use it since birth and it can be your ultimate stroller! Thanks to it, traveling with newborn will be also more easy. 3. 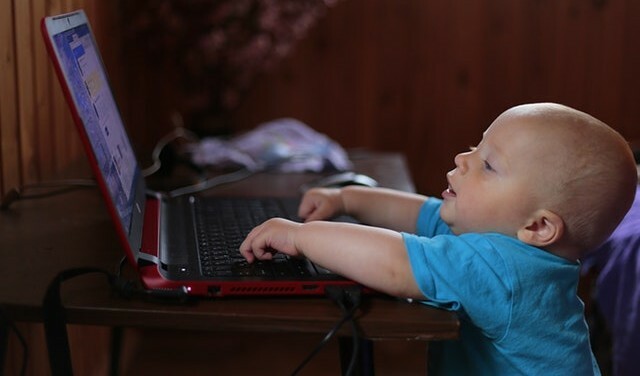 It’s also great for older child who can already walk, but sometimes want to sit for a while when he’s tired. So you can carry folded Pockit on a shoulder or in your bag and open and fold it whenever you need it. You can check GB Pockit+ current price and available colors here. If you want to learn more about the features that new model has, read my full review of GB Pockit+. This is one of my favorite strollers for day trips, shopping and running errands in the city. It weights 17 lbs so it’s somewhere in the middle between standard and lightweight strollers. However, with so little weight, it has a lot to offer. And if that’s not enough for you, there are additional bag hooks, where you can hang the bag with our essentials (weight limit of 5 lbs). Of course storage space is an important feature, but not the most important. Let’s take a closer look at other functions that Summer Infant 3Dtote can offer us. The seat is suitable from 6 months up to 50 pounds. 5-point harness has 3 height positions so it adjust to your growing baby. There are pockets for snacks and sippy cup and toy hooks hidden inside. After folding it’s pretty compact and can be carried on a shoulder. 3Dtote Convenience Stoller has four dual 6” wheels and front suspension to provide smooth ride. Front wheels are also lockable for tougher surface like cobblestone. 3Dtote small wheels are better for flat terrain than bumpy grass. The stroller is not suitable for newborn and although it features compact fold it doesn’t meet carry-on luggage regulations for airplanes. 1. Many lightweight strollers often tip over when they are loaded. But not 3Dtote! Thanks to its sturdy and balanced design, you can avoid this issue and you’re baby will be always secured. 2. If you love going shopping with your baby or often go for day trips this stroller will definitely keep up with you and your adventures! Thanks to it visits to the ZOO or grandparents won’t be a problem. 3. Summer Infant 3Dtote Convenience Stroller is one of the inexpensive umbrella strollers in 2019. You can check the current price here. This is the original, first version of famous GB Pockit stroller. It has less features than Pockit+ model, but it has some advantages too. Some parents find it even better than the new, Pockit Plus! This one is not suitable for newborn babies – it’s not compatible with infant car seats and doesn’t offer a carrycot. The main seat doesn’t recline and the canopy in tiny. But this stroller weighs only 9.5 lbs and features World’s smallest fold! This is the most compact and lightweight stroller for traveling parents. It folds up into a small package that fits into mom’s handbag. At the same time it’s very durable and roomy enough even for a 5-year-old! This slim urban stroller is perfect for running errands with the baby, going to Disneyland and of course airplane travels. Simply one of the best baby strollers of 2019. GB Pockit glides easily over flat surfaces and it’s very convenient to steer and push, especially for short people. But since the wheels are small it doesn’t handle bumps on the ground very well. The storage basket is small, but you can’t expect more from such a compact stroller. Still, it can hold a small diaper bag or some snacks, drinks and toys. The seat fabric easily detaches and it is machine-washable – big plus. 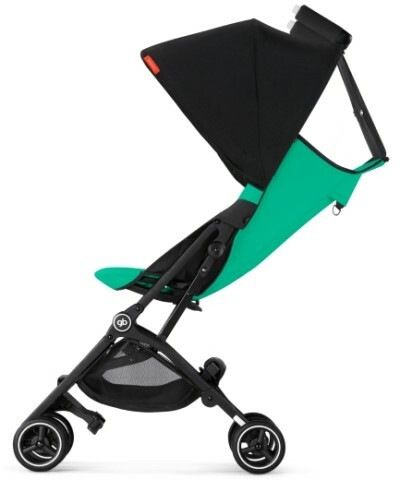 If you’d like to read more information about GB Pockit stroller check my full review. The biggest parents’ complaint about this stroller is the canopy – it’s very small and fragile. It doesn’t shade the baby. 1. This stroller is an investment for years. It can accommodate heavier and taller children thanks to long and roomy seat and capacity of 55 lbs. 2. It an ultra-lightweight stroller, very convenient to carry. It weighs only 9.5 lbs so you won’t even feel it on your shoulder! 3. You won’t have any problems with storing this stroller or using public transportation with it, because it’s very compact when folded and open. Perfect for small spaces. This fantastic lightweight stroller arrived on the market last year and during that time it became extremely popular. It doesn’t surprise me – Diono Traverze is one of the lightest strollers out there, it folds easily to a compact size that is perfect for travel by train, bus, metro and of course airplane! But that’s not all. This lightweight stroller is truly travel-proof as it is equipped with a travel bag and a telescoping handle which allow you to pull the stroller along. Just like a suitcase! It really works as another piece of your luggage. This makes going through crowded airports and bus stations much, much easier. Diono has really spoiled me! Now I’m wondering why all lightweight travel strollers don’t have this feature?! Cushy, padded seat with mesh sides – perfect for hot weather. Adjustable 5-point harness (even the crotch strap is adjustable) with padded covers – really nice addition. Mesh panel on the canopy that allows for good air-flow. It doubles as a peek-a-boo window. The cover has magnetic closure so you won’t wake up your baby when you want to check on them. It includes a rain cover and you can store it in a convenient pocket hidden in the calf rest – really handy. Storage basket expands a little bit on the back. The extension closes with magnets. Even if you don’t put there a lot of things thanks to the extendable opening you have easy access to the basket. Useful zippered pocket on the back of the seat – for your phone or cash. 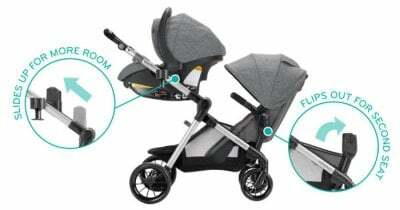 The brake is located in the middle of the rear axle therefore it’s easy to find with a foot (many lightweight strollers have tiny pedals close to the wheel which are hard to find and press). Besides, it’s flip flop friendly because you don’t have to lift it – press to engage, press to release. One-hand steering – with a heavy toddler this lightweight stroller maneuvers like a dream, even in crowded places. Of course the small wheels are suitable mainly for flat surfaces like pavement or smooth hard-packed paths. Of course this stroller is not ideal and there are some things that we can complain about. For me the biggest drawback is the seat depth. I wish there were few more inches to make the seat more comfy for bigger baby, especially since the stroller has high weight capacity (45 lbs). The canopy is not very long, it’s just okay. It may not cover the baby when the seat in fully reclined. Speaking of recline – it’s not generous either. 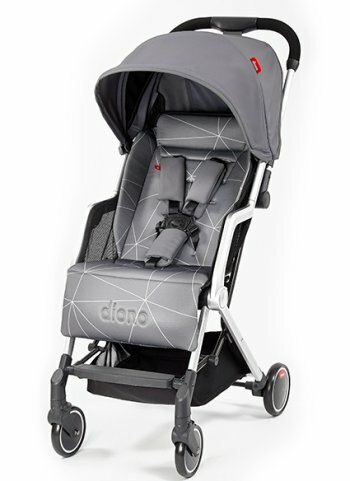 I’m not sure why Diono says this stroller is newborn-ready, because the recline is not even near-flat. Anyway, it’s sufficient for toddlers who still like to nap during strolls. Despite these flaws, I’m still impressed with this stroller. It’s designed for travel and it does the job REALLY WELL. There’s no flat recline – I would rather recommend this stroller for babies who can sit upright on their own (about 6 months and up). Although Diono has information on their website that Traverze is suitable from birth, I wouldn’t use it with a newborn baby. 1. This is one of the top strollers in 2019 for traveling parents. Fold size is really small and fits in overhead bin on many airplanes. It weighs 12.3 lbs so it’s effortless to carry and it includes travel bag and pull along handle so you could quickly get through the airport. 2. Super easy one-hand fold. The stroller collapses in three seconds. You won’t have any problems with it when you’re on your own, it’s also perfectly simple for grandparents. 3. Mesh sides of the seat and large mesh window on the canopy provide nice ventilation and protect baby from sweating. Are you looking for a tiny travel stroller with sleek look? Silver Cross Jet will definitely meet your expectations! This brand is well known for luxury design and top notch quality. Jet is no exception, therefore it deserved place in my ranking of the best strollers of 2019. Of course it’s not all about fashion, but also comfort and ease of use. Silver Cross Jet seat offers flat recline that together with lifted calf rest, according to the brand, is suitable for newborn babies. But it’s not the only way to use this stroller from birth. You can also turn it to a lightweight travel system, thanks to its compatibility with Maxi-Cosi Mico AP, Mico 30 and Mico Max 30, Nuna Pipa and Cybex Aton, Aton 2 and Aton Q infant car seats (you can find adapters here). Another feature that you’re going to love is its tiny, compact fold. According to information on Silver Cross website it’s small enough to fit in overhead compartment on many airplanes. Thanks to that, your travel will be less stressful – no more worries about stroller being damaged or lost in transit. As a travel stroller Silver Cross Jet comes with a useful cover that not only keeps it compact, but also protects it from dirt and dust during transport or storage. It’s worth to mention that Jet has also few more accessories included. It comes with a toddler bar, rain cover and luxury harness pads. Bumper bar doubles as a carry handle, as well as pull-along handle that allow you to pull folded stroller like a suitcase. It’s a smart solution – it makes getting through airport much easier. I only wish the bumper bar was a bit longer as it may be too short to pull along for tall parents. But it works great as a carry handle and since the stroller weighs only 13 lbs your arms won’t hurt while you carry it around. Of course this stroller isn’t perfect and although fold size is really awesome, folding itself isn’t that impressive. Why? It’s a few step process that rather requires using both hands and definitely takes some time to get used to it. Jet is a compact travel stroller therefore it doesn’t have very large wheels. But there is built-in suspension that soaks up small bumps. Of course it works best on flat surfaces like pavement, as well as hard-packed gravel or short grass. There’s one more thing that I’d like to mention here. Silver Cross Jet Stroller can hold up to 40 lbs* but it’s quite shallow. I would say it’s most comfortable up to 2-2.5 years. 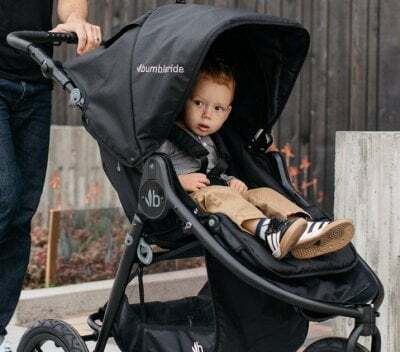 *The brand has updated the limit to 40 pounds when the stroller was already on the market, after positive results from weight tests. Handlebar is quite low and may be more comfortable for short parents (less than 5’6″ tall). The basket under the seat is small and has a bar in the middle so you can’t put there a diaper bag. On a positive note, it can hold a few loose things like a jacket, diapers, small blanket and bottle of water. Because of such a tiny basket I wouldn’t recommend Jet as main, everyday stroller. 1. It’s a high-quality stroller for travel – one of the lightest and most compact on the market. Works perfect for travel by plane, train, bus or car. 2. Flat recline is suitable for newborns, and also comfy for toddlers who like to nap during strolls. 3. It’s a good choice for summer trips. 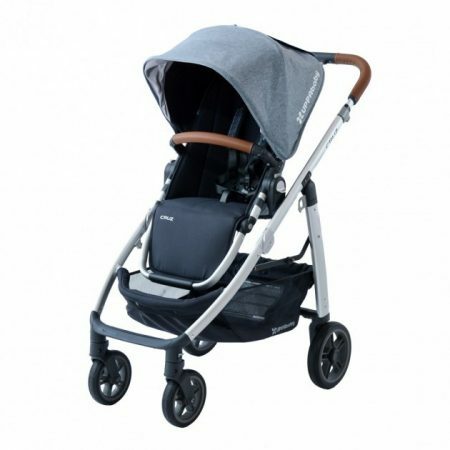 As for a lightweight stroller it has really generous canopy that protects the baby from sun, and thanks to the mesh seat top little rider is not sweating and overheating either. This is another new stroller for 2019 and in fact, the first of its kind! Moms and dads, let me introduce you to Cybex Eezy S Twist – first stroller with revolving seat! Thanks to this fancy feature we can reverse the seat using just one hand. We don’t have to remove and lift the seat to reverse it. With new Cybex Eezy S Twist we can simply rotate it 360 degrees and set it in any direction (check the video below). This might be the most innovative and even the best stroller 2019! Cybez Eezy S Twist is so easy to operate and convenient to use that I’m sure you will fall in love with it! The seat is also nicely padded and multi-position recline to provide comfy place to relax or nap. Maximum capacity is around 37 lbs or 4 year. 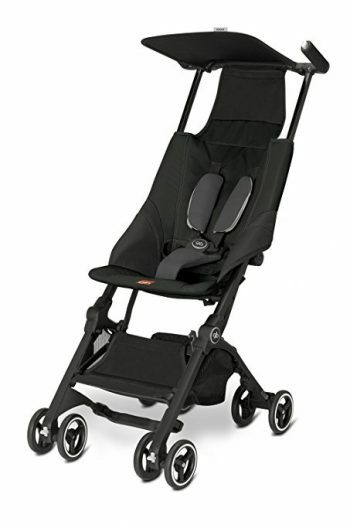 Cybex Eezy S Twist is light, agile, easy to navigate and parents can push it with just one hand. Besides, this stroller easily fits through tight corners, store aisles and crowds. Other features of this innovative stroller are: easy one-hand recline, compact fold and decent, easy to access basket under the seat. There is also 2-panneled canopy with a sun visor and 4-wheel suspension. 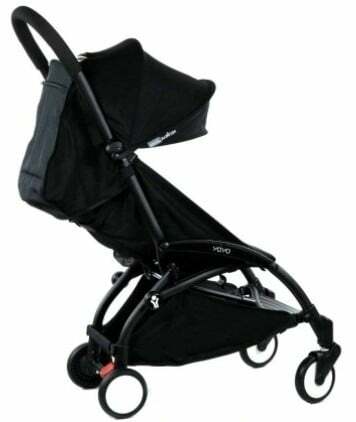 Moreover, Cybex Eezy S Twist is suitable for newborn with a cocoon carrycot or infant car seat. There will be available also simpler version – Cybex Eezy S which doesn’t feature the revolving seat and can’t be used with the cocoon, but has all other functions. It has small wheels which handle flat terrain better than bumps. 1. Revolving seat can be really useful for moms after C-section who can’t lift and for parents who have back problems. 2. This can be your primary everyday stroller since it’s so well-equipped and agile. With a compact fold it’s a space-saver for parents who have small cars or small apartments. 3. It can also serve as a lightweight travel stroller because it folds into a small package – perfect for travel by plane, car or train. This stroller was presented at Kind + Jugend in Cologne in September 2017. It’s on the market since 2018 and available for example at PishPosh Baby (click here to check price). You can also read my full review of Cybex Eezy S Twist. Although this stroller was released in 2016, I decided to include it in my ranking as an example of the best stroller 2019. 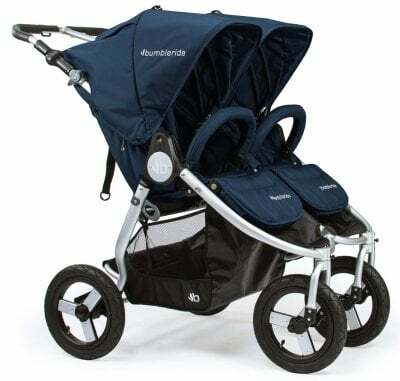 Mainly because it is one of the best full-featured double strollers in 2019 and it can accommodate older and taller kids. 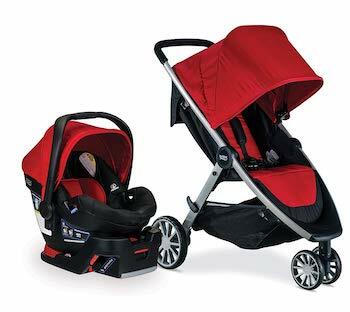 Baby Jogger City Mini GT Double can be used for two infants, two toddlers or two kids at a different age. We can turn this stroller into travel system and install one infant car seats. There is option of attaching two bassinets at the same time and thanks to that you can use this double stroller for newborn twins. What other great features does City Mini GT Double have? It features large sunshades, each has two peek-a-boo windows so you can spy on your passengers the whole time. Each seat is equipped with padded 5-point padded harness to provide your babies with safe and comfortable ride. The seats have multi-position individual recline therefore one baby can nap during strolling while the other one is sitting upright and watching surroundings. 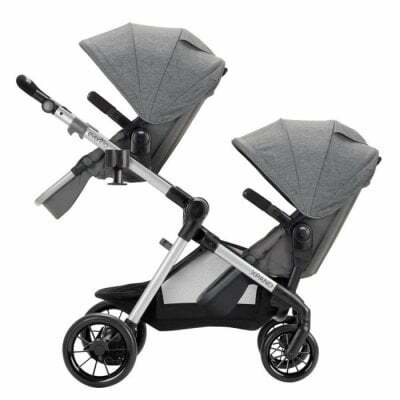 I love the vented tops that make this double stroller perfect for summer strolls. Another great thing is that Baby Jogger City Mini GT Double is suitable even for 4 and 5–year-old kids. All thanks to high backrests and roomy canopies. What parents also love about this stroller are the all-terrain wheels and the adjustable handlebar. 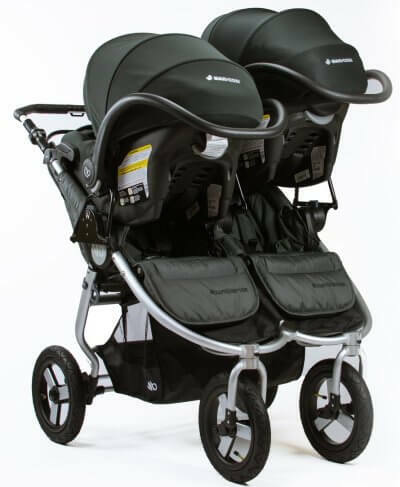 Although this is a double stroller it is very easy to maneuver and turn even in tight space. I’ve never had any problems with fitting through doorways or entering the elevator. Folding is a piece of cake and after that it is a pretty compact stroller and takes up less space in a car trunk or at home than many other double strollers. The underseat basket is quite spacious, but has a bar in the middle and the access to it is a bit difficult. 1. Thanks to all-terrain wheels and suspension it can handle uneven terrain like grass and gravel paths. 2. The stroller can be used for twins or for kids of different age – even up to 5 years! And thanks to option of adding two bassinets or one car seat it’s suitable from birth. 3. This stroller is made of high-quality materials. Built to serve you for a long time. 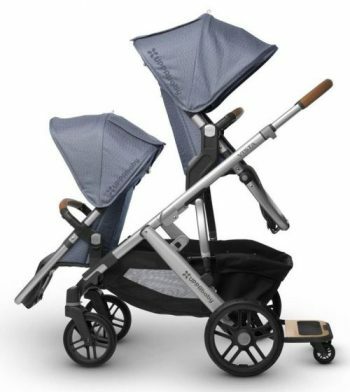 Quality and comfort of famous Indie stroller – in a double version! This is one of the best double strollers for twins, as well as fantastic stroller for infant and toddler. Bumbleride Indie Twin Stroller can be used from birth, and offers three different seating options for newborn babies. Both main seats are convertible and allow you to recline them fully to an infant mode. With flat recline and lifted footrests you have the sheltered place for newborns. So you actually don’t need any additional attachments for using this stroller from birth! Infant mode is perfect for short walks. Each seat adjusts independently, therefore this stroller is also a good choice for siblings with a small age difference. Another option is attaching two bassinets – they provide perfect environment for newborn babies, especially if you like long walks. In contrast to seats in infant-mode, bassinets allow you to face your babies during strolls. There is one more seating option for newborns which I’m sure all parents of twins will love: Bumbleride Indie Twin allow you to install not one, but two infant car seats! There are not so many double twin strollers on the market, that can hold two car seat at a time. Indie Twin has that option and this makes it one of top strollers for twins that can be used from birth through toddlerhood. Currently there are adapters for Maxi Cosi, Nuna and Cybex car seats. PRO TIP: If you want to attach two infant car seats it’s cheaper to purchase this adapter set than two single adapters. 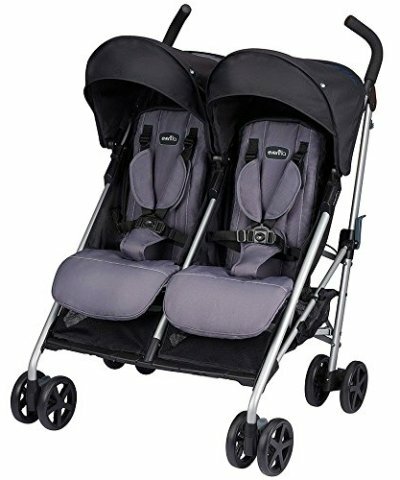 There is one more feature that make Indie Twin one of my favorite double strollers: its suitability for multiple types of terrain. It has four large wheels with air-filled tires plus suspension that cushion the ride and allow you to easily push the stroller over bumps and cracks. Its slim design allows you to push it with one hand, and thanks to the wheel design the stroller is really maneuverable and convenient to steer. Another advantages are long canopies that adjust separately and provide good amount of coverage, even when the seats are fully reclined. At the same time you don’t have to worry about blocked air-flow – each seat has vented top which you can unbuckle on summer days. The basket is quite spacious and what’s really important, offers clear and easy access to your stuff. There is no bar in the middle that would block the access (like in many other double strollers). 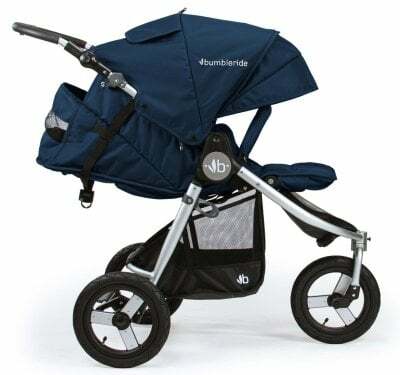 Folded Bumbleride Indie Twin Stroller is fairly compact (32.5″ x 29.5″ x 13.5″) and stands on its own. Good thing is that the seat fabrics don’t get dirty because they are inside the folded stroller. I only wish it was lighter – 36 pounds means it’s quite a beast! But even though it’s heavy, it’s still one of the best baby strollers 2019. Indie Twin has been tested and approved to be used with Maxi Cosi, Cybex and Nuna infant car seats. However Nuna Pipa is a bit harder to get on and off. If you have these car seats, you should watch this video to learn how to properly attach and detach Nuna Pipa car seat. 1. This stroller is a breeze to push and maneuver even with two kids in it! 2. It’s really versatile and suitable for daily use in the city, as well as for strolls on rough terrain (with locked front wheels). 3. It’s one of a few double strollers for twin that accepts two infant car seats at a time. Mountain Buggy Duet has been already the narrowest double side-by-side stroller in the world and after the last upgrade it has new, even more useful features. Mountain Buggy Duet 2017 offers easier one-hand folding system, more compact fold and more stable frame. Manufacturers added a handbrake to the new version of this stroller. Therefore parents can be sure they control the speed and they can slow down at any time during a stroll with two children. Thanks to longer seats, Duet 2017 can accommodate even 4-year-old kids. There are also new gear tray storage compartments added to the basket under the seat. This stroller makes going out with two children more easier and enjoyable! Why so many parents love Mountain Buggy Duet? This is a double stroller but it is as narrow as a single one (only 25”!). Thanks to it the stroller is very easy to push, navigate and turn even in tight corners. Mountain Buggy Duet can be also used as a single stroller because we can change one seat for large bag. Moreover, this stroller is compatible with many infant car seats. 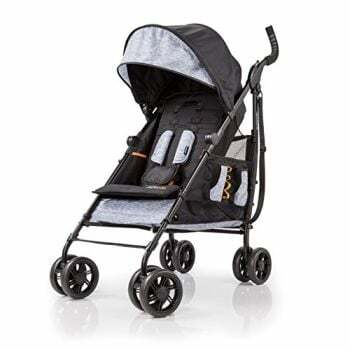 Mountain Buggy Duet is one of the best baby strollers in 2019 and can be purchased in new color versions: Grid, Marine Blue (which I like the most), Black and Silver. Find out more in my full review! Air-filled tires require inflating once in a while and it is good to keep a pump in a storage basket, just in case. 1. Duet proves that double stroller doesn’t have to be sluggish and bulky. You won’t have any problems with steering or getting through tight spaces! 2. Mountain Buggy Duet 2017 is a smart investment as it grows with the babies and can be convert easily from a double to single and from a travel system to toddler stroller. It is a great option for parents who plan on having or already have two children. 3. Baby’s safety is the most important thing for every parent. In Duet you really control the speed and have the ability to stop the stroller immediately, thanks to parking brake and additional hand brake. Mountain Buggy Duet is rather expensive stroller so before you purchase it, make sure it really meets your needs and read customers reviews at Amazon. 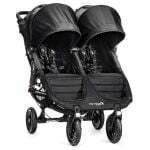 Evenflo Minno Twin Double Stroller is a fantastic lightweight double stroller. It’s designed for twins or two kids with small age difference. And the best part is the low price. If you’re on a tight budget, this model will suit you perfectly. What features does Minno Twin have? Each seat has deep, comfortable padding and can be individually reclined. The recline is not very deep but it’s sufficient for toddlers who still like to nap during the day. Notice that Evenflo Minno Twin Double Stroller is not suitable from birth. The recline is not newborn-ready and you cannot add infant car seats or bassinets. The canopies also open separately. I only wish they could extend further to provide more shade! There are two decent mesh storage baskets underneath the seats which you can access from the back (only when the seats are in upright position). What’s really great is that this double stroller weighs only 26 lbs and it is 27 inches wide. So you won’t have problems with fitting through standard doorways or lifting it to the car trunk. It folds up quite compact, like an umbrella type stroller. Although Evenflo Minno Twin has some drawbacks, it works great as a second stroller. You can go with it to the mall, museum or park. Besides, it costs less than $150! This may be one of the best double strollers for 2019! The stroller has four small dual wheels. They are not designed for bumpy terrain. 1. Thanks to such a lightweight and compact design, going out with two kids will be so much simpler! 2. This is a budget option. Even if you purchase the additional accessories it’s still very cheap. 3. You can adjust the seats and canopies separately, therefore this stroller is not only perfect for twins but also for infant and toddler. This stroller comes in a few versions. You can purchase just the stroller or as a set with accessories. Make sure to check all prices to find out what’s most beneficial – you can check it here. I’ve already loved the prevoius version of BOB Revolution Flex but thanks to recent updates this is one of the best jogging strollers of 2019. 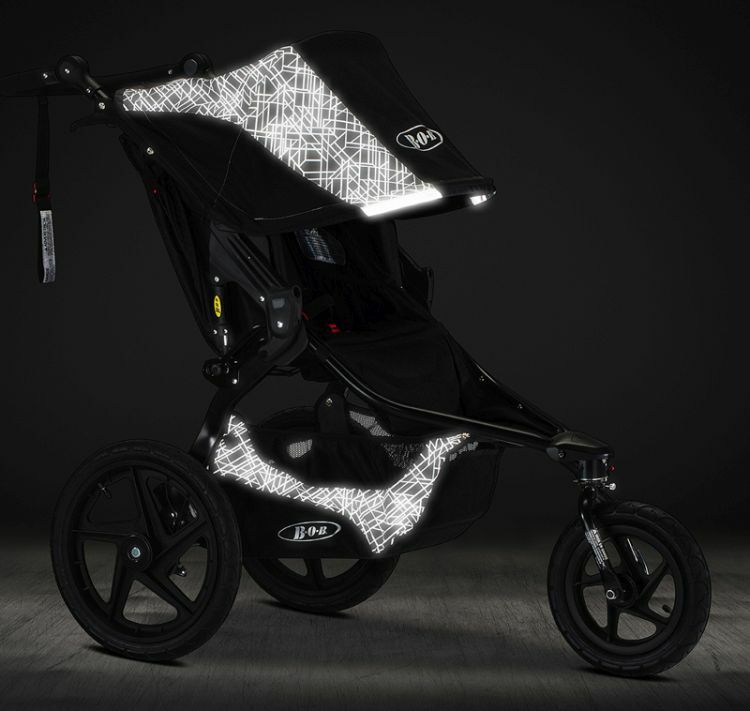 BOB Revolution Flex Lunar has one awesome color version – black fabric with grey geometric pattern that glows in the dark. BOB takes care of babies and jogging parents safety. You can go for an evening jog or morning stroll and lunar reflective fabric will keep you safe and visible! Of course the fabric is not the only great feature of BOB Revolution Flex Lunar. This stroller is equipped with pivoting lockable front wheel. When the wheel is set in “swivel mode” it gives better maneuverability in tight spaces. On the other side, locked wheel increase stability which is essential during jogging or going over rough and bumpy terrain. The handlebar has 9 height positions which provides comfort of using for tall and short parents. And of course – amazing suspension system and big wheels with air-filled tires! Thanks to them the stroller rolls smoothly and your baby can enjoy truly bumpless ride. BOB Revolution Flex Lunar works excellent as an off-road vehicle. The new Flex Lunar has not only excellent quality and performance but also takes care of your safety! Toddler seat is reclining, nicely padded and euipped with 5-point harness. The whole seat is very roomy and has great air-flow. There is also extra-large canopy which will definitely protect your passenger from sun or wind. It has also a peek-a-boo window so you can keep an eye on your little adventurer during jogging. You can start jogging with your baby when he can sit unassisted. To use this stroller from birth (for walks) you will need an infant car seat. Another things is that Flex Lunar, as a jogging stroller, is pretty big and heavy. To simplify storage and transportation you can remove the wheels. 1. This stroller protects babies and parents by keeping them always visible. 2. It has the best wheels and suspension system in the whole World. Thanks to them you and your kid will forget about bumpy and uncomfortable rides. 3. You don’t want your baby to get bumped around during jogging and have problems with spine, right? With with stroller you can literally go wherever you want (even off-road) and the ride will be always super smooth and cushioned. After testing this stroller for a few weeks and reading hundreds of positive reviews of other parents, I just have to put this stroller in my ranking. I’m a big fan of jogging with kids therefore I’m very careful and accurate when choosing joggers. And I must admit, Joovy Zoom 360 has impressed me very much! 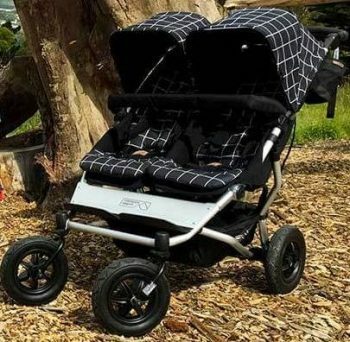 What makes Joovy Zoom 360 one of the best strollers of 2019? Amazing wheels with air-filled tires (tire pump included!). The rear wheels are 16” and the front one is 12”. The front wheel swivels for better maneuverability and locks for more stability during jogging or going over bumpy terrain. And you can push it almost effortlessly. Excellent suspension system that absorbs shocks. I am a regular user of BOB Revolution PRO and I was convinced that I would not find a second stroller with such a great suspension, but Joovy Zoom 360 has impressed me once again. Compared to previous version, the new Zoom 360 Ultralight is even more light, sturdy and better performing. It weighs only 25.7 lbs so as for a jogger it is pretty easy to carry and transport. The seat is very roomy and suitable for a child from 3 months up to 75 lbs and 42 inches! There are mesh pockets inside in the seat where the passenger can hold some snacks and take-alongs. The canopy is large and gives nice coverage in any reclining position. There is also a peek-a-boo window. This pushchair offers plenty of storage: good-size basket under the seat and parent organizer with zippered pockets for your essentials and two cup holders. But that’s not all! 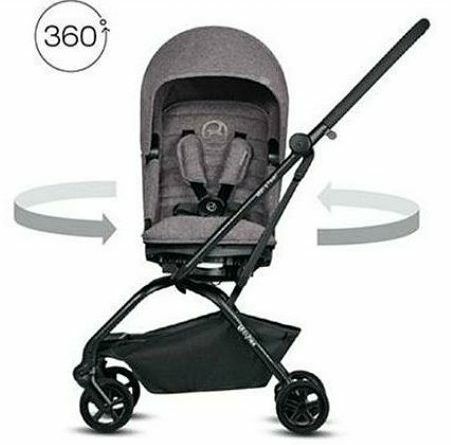 Joovy Zoom 360 Ultralight features also compatibility with most infant car seats! Just click in and the stroller is ready for walks with newborn. I always check other parent reviews before I buy a stroller and with jogger it is even more crucial for me. Last time I checked at Amazon this stroller had over one hundred reviews! This is an incredible score! Parents love it for sturdy construction and easy steering even on dirt roads and wooded trails. Even with a big kid on board it pushes like a dream. The only thing that parents complain about is the big size and folding mechanism which takes practice. The seat has high weight limit, but the seat back is not the longest one. This stroller is suitable for older and heavier childr, but not for taller one. 1. During strolling or jogging over rough terrain, you want your child to be protected from negative effect of bumpss. Joovy Zoom 360 ensures extremely smooth ride on any type of terrain. 2. 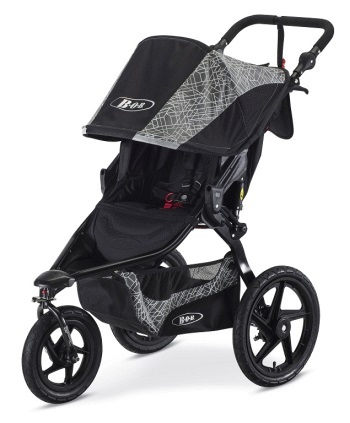 This well-built stroller is one of the lightest joggers on the market! Taking in and out of the car trunk is so easy. It can actually serve you also as an everyday stroller. That’s my whole ranking “Best Stroller 2019”. The strollers I picked not only truly impressed me during tests, but also have many great reviews from other parents. Every baby and its parents have different needs and lifestyle. Choosing the stroller that will meet those needs isn’t an easy decision. That’s why I create my own ranking of the best strollers of 2019 to help parents choose the right one.​ My Ranking includes 25 best strollers available on the market for 2019. 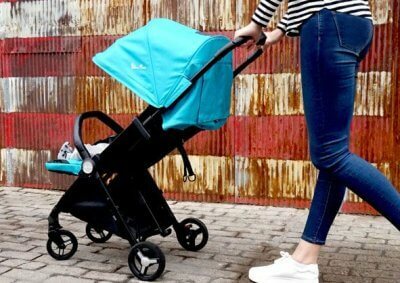 It contains stroller that come out in 2019, at the end of 2018 or in previous years and are TOP quality. I also made a list of completely new strollers for 2019 (it’s here). Of course there is a story behind all of it… Few weeks ago I met with my friend from college. She was 6 months pregnant then and a little stressed because she still hadn’t bought all of needed baby gear. I was thinking about the answer for a moment, of course I wanted to help my friend as much as I could. On the market there are available couple of types, dozens of brands and hundreds of models of strollers. Which ONE is the best? In fact, this was quite a difficult question. Especially since my friend didn’t specified what type of stroller she need. I asked her a few questions about her life style, useful functions she would like to have and the budget she has planned. After a long talk we finally define what stroller would meet her needs. One thing she was sure about: it has to be new, modern stroller so she could purchase some accessories for it later and expand the stroller if she had a second child. In the end, I recommended her three strollers from my ranking. This conversation reminded me how difficult is to choose the right stroller. Especially since at first new parents don’t know what type of stroller would be the best for them, what features they would really need. Buy a convertible all-in-one stroller or buy two strollers? There are so many strollers on the market, no wonder that new parents might feel overwhelmed! I’ve been there!! That’s why I thought a ranking of the best strollers of 2019 may be useful for some parents. Ranking with brand new strollers, that were released this year and strollers that were recently upgraded. A list with key information for those who don’t know yet what stroller they want. I tested dozens of strollers, I read other parents reviews posted on many websites, I visited many stationary stores and I strolled many miles for many hours. Then I put all of the information together and after almost three weeks this review is complete. I picked 25 best strollers of 2019. All models that are included on my list are THE BEST strollers available on the market today. They are distinguished by high quality, durability, multi-functionality, safety and comfort. These qualities were most important to me during tests. 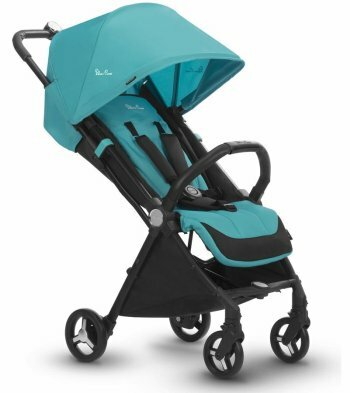 If you have been struggling with the choice of a stroller for few weeks or months already and you still have no idea which one to choose, you can just pick one of the best strollers of 2019 which I recommend (and hundreds of other parents too!). Hi Zooey, what do you think about the Hamax Outback? I don’t see it on your list and was wondering if you’d run across it during your research. Thanks! Thank you Zooey for the detailed reviews! This makes shopping for a stroller so much easier. I’m looking for a stroller that is reversible, will lay flat, gives a smooth ride over varied terrain, preferably with cup holders and belly bar. I don’t need a carrier/car seat and it’ll be for a single child only. Looking to stay below approximately $400, any recommendations? I’ve given myself a migraine trying to research it and we live 3 hours away from the city so it’s been all online. Hi Brandy, I’ll be honest – it is a difficult task 🙂 It seems like the stroller with bassinet option would be the best for you. You have two solutions: you can buy a stroller that offers a toddler seat and a bassinet (included or sold separately) or a stroller with 2-in-1 convertible seat that can be turned into a bassinet. If you’d prefer a stroller with convertible seat (it takes up less space and you have only one piece of baby gear to store) I can recommend you Graco Modes (you can buy just the stroller, without the infant car seat – here) – the seat is 2-in-1, so during the first 6 months you can use the flat recline which looks a bit like a bassinet. When the baby can sit upright, you can raise the backrest and use it as a regular seat. The seat is reversible as you prefer. This stroller comes with parent and child trays (with cup holders), so you don’t have to pay extra for these items. However there is one drawback – the wheels are plastic so they work best on flat terrain. It will bounce on uneven ground. 1. 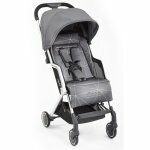 Roan Rocco Classic Pram – it comes with a bassinet and regular seat unit, which is also reversible and reclines almost flat. It has big air-filled wheels and suspension so it rolls really smoothly and can handle even the dirt roads. The seat has bumper bar and a footmuff included. There is no cup holder, but it comes with a diaper bag (which is a rare thing!) and weather cover. It costs about $490-$510, but sometimes you can find it on a sale and get a really great deal (check it here). Considering the accessories included and the ultra-smooth ride I think it’s worth the money. 2. 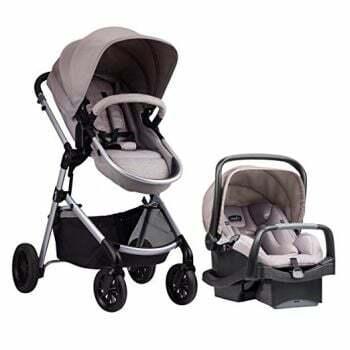 Baby Jogger City Mini GT with additional bassinet – the regular seat doesn’t recline flat (although it is a very deep recline), but for the first 6 months you can attach additional bassinet (it costs about $160-$200). This stroller glides like a breeze over different types of terrain. However the seat is not reversible and the belly bar and cup holders are sold separately (for about $50). Other strollers that can handle many types of terrain and come with bassinet are much more expensive (like UPPAbaby VISTA or Peg Perego Pop-Up. I’m interested in the Silver cross pioneer but I can’t seem to find much information on it 🙁 what’s the update? And where can I buy one? 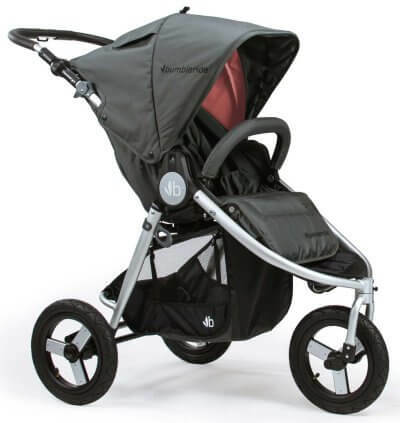 Hi Olga, Silver Cross is a British brand and you can buy their strollers in UK and many other countries in Europe. There are also few retailers in the US, for example Albee Baby. 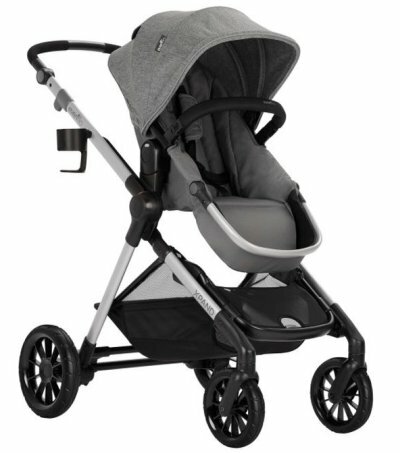 I checked on their website and Pioneer is not available, but there is very similar stroller – Silver Cross Wave. It looks pretty much like the Pioneer and offers 16 seating configuration (it even expands to a double, like Vista). I’m not sure when the Pioneer is going to be available in the US. the best review I have ever read, well done! Hi Zooey. Do you think Mountain Buggy Nano is suitable for travel by plane? 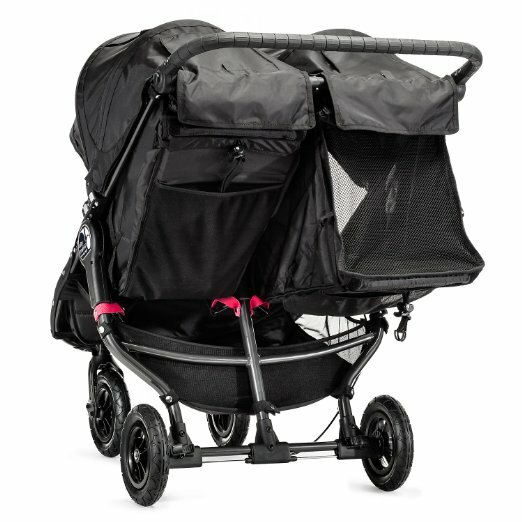 I’m looking for a super lightweight stroller for travel and sometimes for going to the mall. Can’t decide between City Tour from Baby Jogger and GB Pockit. Both strollers that you’ve chosen are great for travel and going shopping. They both offer compact fold and fit into overhead compartments on most of airplanes. However, GB Pockit is lighter (only 9.5 lbs) and folds into smaller package (folded dimensions: 11.8″ x 7″ x 13.8″) than City Tour (weighs little over 14 lbs and its folded dimensions are: 22.04” x 17.71” x 9.05”). But City Tour has more comfy seat and handles uneven terrain better. It really depends on your priorities and how often you will use the stroller. If it’s only for short strolls then I would go for GB Pockit. But if you plan many day trips and long strolls then I would choose City Tour 🙂 Let me know if you need more information, take care!